Media exposure is one of the best ways to spread the word on ones company and achieve recognition in the industry that one part takes in. Here are some of the Media articles that SAVSpeed have featured in. 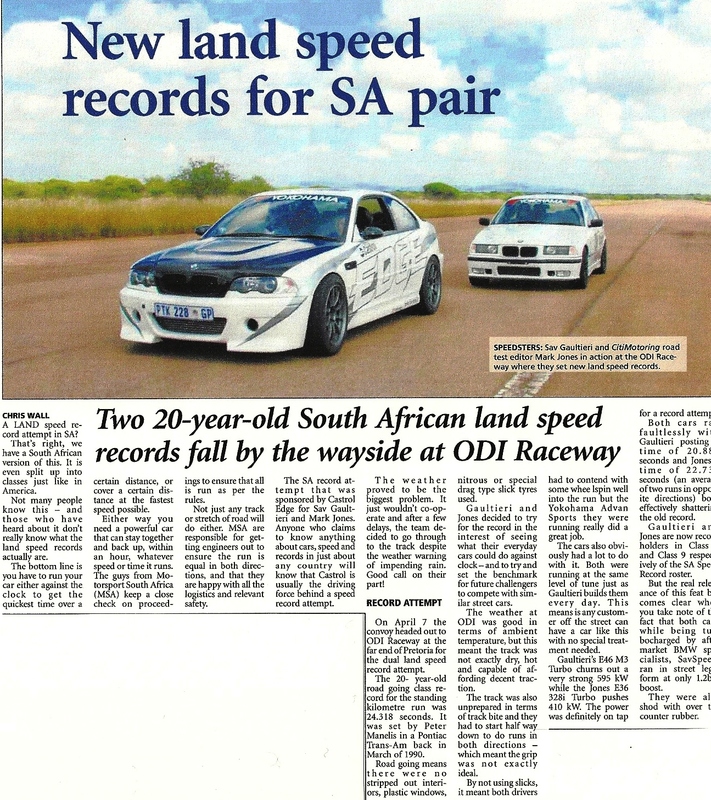 Two Castrol Edge-sponsored BMWs have broken the 20-year-old Standing Start 1km record of 24.318 seconds for road-going cars that was set by Peter Manelis in a Pontiac Trans-Am in March 1990. 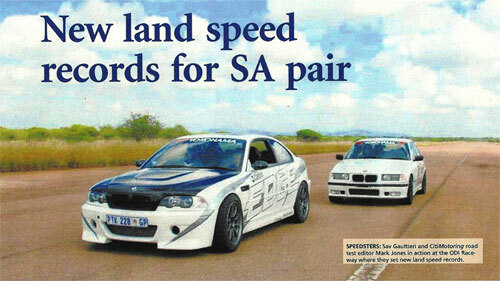 The cars, a 595kW BMW E46 M3 turbo and a 410kW BMW E36 328i turbo, driven by Sav Gaultieri and Mark Jones respectively, ran average times of 20.889 seconds and 22.731 seconds - to not only break the old record, but also post new records in class 9 and 8 of the SA Speed Record register. Both cars ran faultlessly and the times achieved were backed up within the regulatory one hour window period, while Motorsport South Africa (MAS) representatives kept a close eye on proceedings to ensure that proceedings fell within regulations. This record is important because both vehicles, whilst fitted with turbochargers from aftermarket BMW specialists Savspeed Auto, ran in street-legal form at only 1.2 bar boost and were shod with over-the-counter Yokohama Advan Sport tyres. What this means is that there were no stripped-out interiors to reduce weight, plastic windows, Nitrous-Oxide boosting or special slick tyres used on the day. This was done in the interest of recording what these 'standard' cars could achieve and to set the benchmark for future challengers. Last week I kicked off my first story for Double Apex with BMW 335i Racecar build Part One. Click here to read the first installment. Today I bring you BMW 335i Racecar Build Part 2..